For my Savior Jesus Christ, a new Facebook challenge…I am out to prove that my friends will repost this – I hope I am right!! Let’s lift up His name and make a statement. When Jesus died on the Cross, He died for you and me. If you are not ashamed of the gospel of Jesus Christ, copy and repost. I am not ashamed! 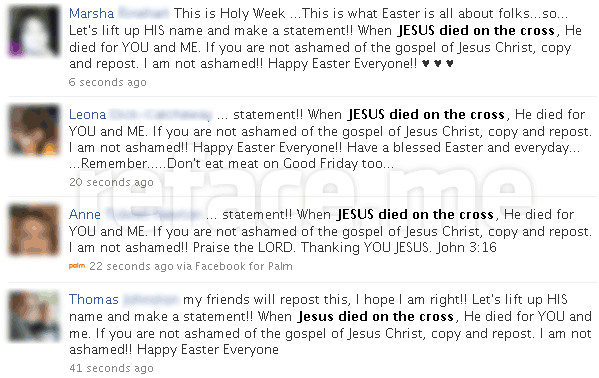 This is Holy Week …I am out to prove that my friends will repost this, I hope I am right!! Let’s lift up HIS name and make a statement!! When Jesus died on the cross, He died for YOU and me. If you are not ashamed of the gospel of Jesus Christ, copy and repost. I am not ashamed!! Happy Easter Everyone! Honestly, we’re not making this up! Here’s a screenshot of our news feed that we made while writing this post. We previously reported that the Vatican discovered Facebook, but we never deemed the pope* capable of kickstarting this “Holy Week” trend. So say it loud if you’re you’re faithful and proud! *Obviously, the pope didn’t start this, but a very tech-savvy reverend. Or did he? 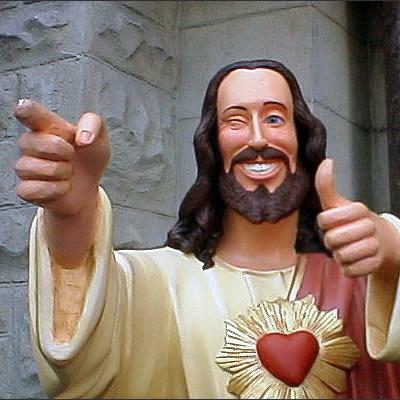 Wacko Wednesday: Who would Jesus poke? Posted by Pieter on April 1, 2010 at 6:19 AM. Use this trackback if you're linking this story.